Who said cooking is like a nightmare when friends and family are around? Enjoy the world of culinary art through Jamie’s hands. Jaime is a British Chef and Author, known for his food- focused television shows, cookbooks and easy Italian recipes. With Jamie’s 20 Minute Meals App for Android you can cook foods which makes great impressions. The dishes are truly delightful and invoke the great cook within you. Jamie’s 20 Minute Meals Android app is all about giving you the tools and inspiration to cook great and tasty food with no difficulty at home. You will get a number of mouth-watering recipes to try and each one will take around 20 minutes to prepare. Also, you will get some great videos with useful tips, valuable tricks and great kitchen skills for artful cooking styles in your kitchen. Jamie’s 20 Minute Meals Android app is very simple to use. You can download the app for $7.69 from Google Play store. You will have 65 mouth watering recipes in Jamie’s 20 Minute Meals app. And, for every recipe in this app you will find eye-catching step by step photographic illustrations. Hence, there is very less chance of going wrong with the recipe. It has complete recipes directions, ingredients and reviews. Above all you can search recipes by food title. Apart from this, you will also get 21 attractive video illustrations which come with useful tips, tricks and kitchen skills from sharpening a knife to chopping an onion. There is also a shopping list which is unruffled as, it sorts the ingredients by alley, hence you can be really swift in the supermarket too. Jamie’s 20 Minute Meal App reinforces the fact that Cooking can be so effortless, stylish and interesting. So what are you waiting for? 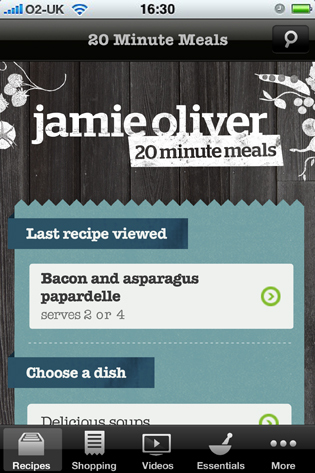 Get on your toes, grab an apron and try out the magic in your finger with Jamie’s 20 Minute Meal App for Android. Let your friends and family know that you can work wonders while dinning at home. Happy Cooking!